The structure of the novel is a series of journal-style entries by Equality. Writing this, in itself Equality explains, is “a sin”, yet he endeavours to explain his own background, his society and his ultimate emancipation from it. Equality realises his ‘curse’—the need to question, investigate and think for himself which distinctly go against the universal themes of his society. This curse finds application when Equality discovers a subterranean tunnel containing items from the ‘Unmentionable Times’ (Before the Anthem-ic society) where he is able secretly to write his journal and perform minor scientific experiments. These experiments lead to the discovery of rudimentary electricity and light bulbs—discoveries that Equality believes would be hugely beneficial to society. In the meantime, and even though “men are forbidden to take notice of women”, Equality meets with Liberty 5-3000, a female member of the society. They express feelings for each other, and it becomes apparent from Equality’s notes that they have fallen in love. Equality is suddenly imprisoned after he overstays his time in the tunnel one evening and is missed. During subsequent questioning Equality refuses to reveal any information concerning his whereabouts and is placed in the ‘Palace of Corrective Detention’. Here he is tortured and persistently questioned. He gives nothing away and is able to escape to the tunnel after thirty days of imprisonment. The following day he presents his findings to the societal administrators; the ‘World Council of Scholars’ who, instead of being pleased with his discovery respond in anger and terror. Equality can do nothing but take his invention and flee the city to the outlying area known as the ‘Uncharted Forest’. Here he begins to identify with his own freedom and what it might mean. Shortly after his escape he again meets Liberty, who has left the city to follow him. Overjoyed with their reunion, the pair discover an old house from the ‘Unmentionable Times’ and take residence there. Here Equality finds a great number of books and, upon reading, discovers the ‘Unspeakable Word’, ‘I’. The concept rocks Equality’s collectivist perceptions and endorses his internal idea of individualism. He adopts the name of ‘Prometheus’ and gives Liberty the name ‘Gaea’, both allusions from Greek mythology. The novel closes with Prometheus questioning what had brought humankind to concede their individuality and making plans for the future with Gaea. What a reader of Anthem is immediately alerted to is the use of plural pronouns; ‘we, ‘our’, ‘they’ etc as a means to describe both himself and others. There is no ‘Me’, ‘Myself’ or ‘I’, in fact such utterances are deemed as ‘Unspeakable Word(s)’. From the outset this creates intrigue, yet an unfamiliar atmosphere for the reader. This management of language resonates with Orwellian ‘Newspeak’ where language has been manipulated to meet political aspirations regarding control in Nineteen-Eighty Four. The people of Anthem are unable to express themselves as individuals and thus the concept of the individual is rendered almost obsolete. A further parallel might be drawn in the way occupants of Brave New World’s World State view words such as ‘family’, ‘mother’ or ‘father’. These words are deemed almost unspeakable and, when used, are done so in a derogatory way. For a feminist reader the book seems to deliberately remove any female allusion. The terms used for society are distinctly masculine; ‘man’, ‘brotherhood’, ‘brothers’—there is no suggestion of ‘sisterhood’ or ‘sisters’ to identify the females in the novel. The novel is limited and tightly gendered in its language and this might, for some, overshadow a closer feminist analysis of Anthem. However, a close reading of the female character Liberty does little to give the story any feminist credence. Liberty has no voice of her own, and essentially follows in the shadow of Equality. Liberty is initially given an entire gushing chapter of praise by Equality but quickly becomes an insignificant support. While Equality is pleased to find that Liberty has followed him, it must be noted that it was she that followed him—perhaps suggesting that she didn’t have the strength or nous to leave the city on her own accord. Equality’s continuing dialogue in the ‘Unchartered Forest’ comes across as quite anti-feminist by many standards. It might be noted that after discovering the word ‘I’ he mentions Liberty on only three occasions. The first is where Liberty tells him she loves him—which he then doesn’t verbally reciprocate as he is more interested in what he has read. Second is where he renames her, maybe suggesting she is somehow incapable of renaming herself. Liberty’s third mention is when Equality tells of her pregnancy. He goes onto state ”My son is to be raised a man”, removing altogether the notion the child might be female. All this comes across as patriarchally idealist, and it might be perceived that Equality’s new found individualism reduces his affections for Liberty. The anti-feminism within this novel is disappointing because unlike most dystopian novels from the early part of the twentieth century Anthem was written by a woman. 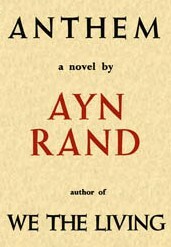 Rand’s later novel Atlas Shrugged contains a strong female character but Liberty seems to be here as a mere convenience to Equality’s individualist ambition. A conclusion might be drawn that Rand is making individualism the priority over mutual companionship and sexual equality. On some levels you can understand this, Rand was creating an argument for individualism and against collectivism, so a strong partnership might undermine this. However this which begs the question—why have such a partnership at all? The most probable answer to this would be for the continuation of humanity outside the city walls, thus demoting Liberty to being no more than a vessel, an incubator for the future of humanity. Anthem is only 105 pages long. It can be absorbed in around 2 hours or less. It is an enjoyable read as it provides a threat, a rescue and a hope to the reader. The character of Equality is simple, some might say a little too simple, but he is believable within the context of his world. The story is well written and worthy of a read as it ticks many of the expected dystopian boxes. The society is haunting and stark and it is easy to relate to Equality’s fundamental need to escape and to seek his own individual identity. From a feminist perspective however it disappoints. Liberty has no voice to speak of and she moves from beneath the subjection of the Anthem society to the subjection of Equality. Written in 1938 therefore it might be suggested that, while the novel is set in a future society, the patriarchy of the early 20th century is alive and well within its pages. This is ultimately dissatisfying because Rand had the means to create a realisation of her protagonists name, ‘Equality’, yet seems deliberately to have chosen not to. I wonder if Rand's focus on individual freedom from societal oppression to the exclusion of any gender equality issues in this piece isn't akin to the argument that I have heard many intelligent women make, that feminism is "putting the cart before the horse": that fighting for the rights of women when there is still poverty, slavery, racism and such inequalities in the world shows a lack of perspective. That's a good point, and I disagree with that perspective too. There is a good argument against this; just this week they released the The Global Gender Gap Report, and one of it's authors arguments is that greater gender equality results in economic progress. This in turn might suggest a decrease in levels of poverty etc. Racism is something different altogether but I'm writing an essay at the moment about understanding the interconnections between gender, race and class. Most of the academic literature I've read essentially supports what you said- progress lies in addressing these problems as a whole (and understanding the relationships between race, class and gender) rather than individually. Ok, being a devils advocate a bit here though, is criticising Rand's focus on collectivism a bit like suggesting that (for example) our charity is more deserving than hers? (1) Ian_Sales wrote: "isn't complaining about Rand's lack of feminism a bit like complaining that Hitler was a vegetarian?" (2) Kiskil wrote: "Is Anthem considered a feminist novel? Am not sure it can be critiqued in feminist terms simply because the author is female." @Ian_Sales I don't think so. My criticism of Rand is from a literary perspective and specific to Anthem. I wouldn't even say it was a complaint, rather an specifically feminist critique of the text. If I was to consider all her novels I would probably argue very differently. @Kiskil I don't believe Anthem is considered a "feminist" text, but you can certainly still critique literature from a feminist perspective. You have to consider the texts use of gender and how that gender is portrayed. I think it might have been wrong of me to put across the notion that just because Rand is female, the book 'should' have been stronger from a feminist perspective. It wasn't my intention but I can see how that might have come across. I really enjoyed the story, but I felt Rand's treatment of Liberty was unfair because she was portrayed as weak, in comparison to the strength of the male character Equality.